The year is 2039. World wars have destroyed everything and territories are run by corporations, the mightiest – and cruelest -- of which is Tekken. Jin Kazama (John Foo) witnesses the death of his mother Jun (Tomita) by Tekken in the slums known as Anvil. Vowing vengeance, and armed only with his street smarts and raw fighting skills, he enters a dangerous and potentially deadly combat tournament, where he must defeat the world's most elite fighters to become the "King of the Iron Fist." Witness the warrior of the future today! The videogame of the future comes to full live-action life when Anchor Bay Films and Manga Entertainment release Tekken on July 19th. Directed by Dwight H. Little ("Bones," Halloween 4: The Return of Michael Myers), Tekken stars Jon Foo, Kelly Overton (The Ring Two), Cary-Hiroyuki Tagawa (Planet of the Apes, Pearl Harbor, Balls of Fury), Ian Anthony Dale (The Hangover, The Bucket List), Darrin DeWitt Henson (Stomp The Yard, "Soul Food"), former world champion kick boxer Gary Daniels (The Expendables), MMA fighters Cung Le (Pandorum, Dragon Eyes), and Roger Huerta, Luke Goss (Hellboy II: The Golden Army, Blade II), and Tamlyn Tomita (The Day After Tomorrow, The Joy Luck Club.) A Crystal Sky Production, Tekken will be available as a Blu-ray/DVD/Digital Copy combo for $39.99 SRP, as well as a standard DVD edition for $26.98 SRP. Pre-book is June 22. Tekken also features such fight superstars as Lateef Crowder, world-renowned expert in the Brazilian martial art Capoeira, and Anton Kasabov, multiple-time U.S., European and World Champion in Tae Kwon Do. 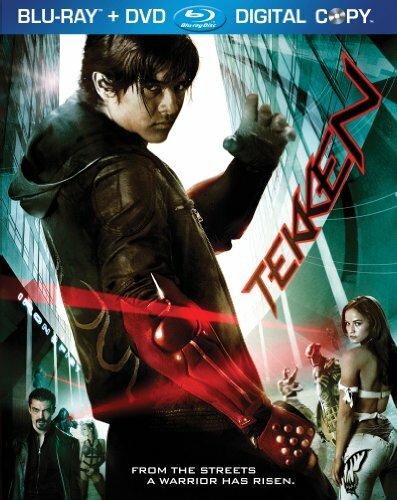 Anticipation for Tekken's release has been high ever since the film's trailer was posted on YouTube in January 2010, with over 3.8M views to date! Anchor Bay Films is unique in that it offers the creative community a fully integrated distribution capability on all platforms and an international solution extending beyond the U.S. Anchor Bay Films is a division of Anchor Bay Entertainment and is on the ground providing quality distribution with operations in the U.S., United Kingdom, Canada and Australia, as well as distribution capabilities in other key territories. The company focuses on a platform release strategy for its films with an eye toward maximizing their potential across all ancillary distribution platforms. The company recently released the critically acclaimed comedy City Island starring Andy Garcia and Solitary Man starring Michael Douglas, Kill the Irishman starring Ray Stevenson, Vincent D'Onofrio, Val Kilmer, Christopher Walken, as well as Sundance Audience Award Winner happythankyoumoreplease starring Josh Radnor, Malin Akerman, Kate Mara and Tony Hale. Upcoming releases include, Meet Monica Velour with Kim Cattrall and Toronto International Film Festival award-winner Beautiful Boy with Maria Bello and Michael Sheen. Anchor Bay Entertainment is a subsidiary of Starz Media, LLC (www.starzmedia.com) which is a controlled subsidiary of Liberty Media Corporation attributed to the Liberty Starz tracking stock group.